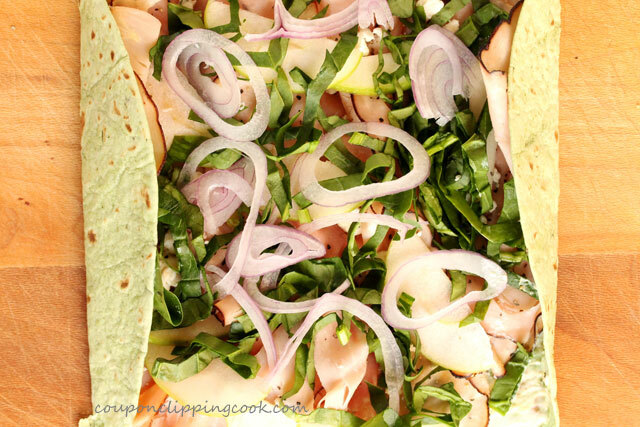 Flavor packed and ready in 15 minutes. 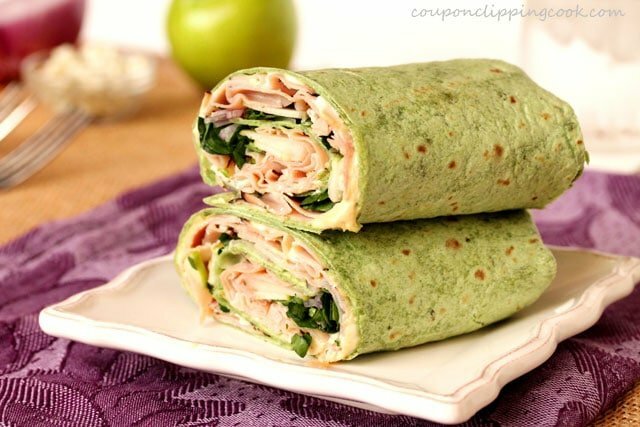 Who would have thought that a green colored sandwich or wrap would look appetizing. 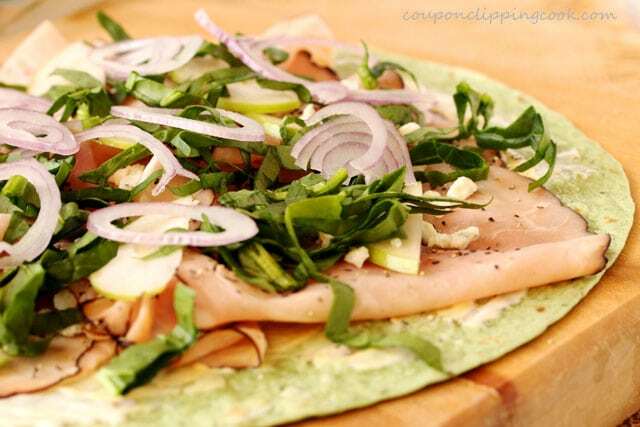 Well this one sure does and it even adds a nice contrast to the scrumptious ingredients that on inside the wrap. 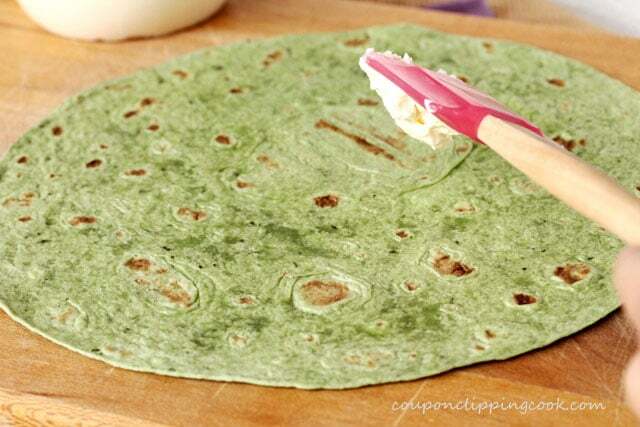 These Garden Spinach Herb wraps are soft which is perfect for rolling, and have a light herb taste. 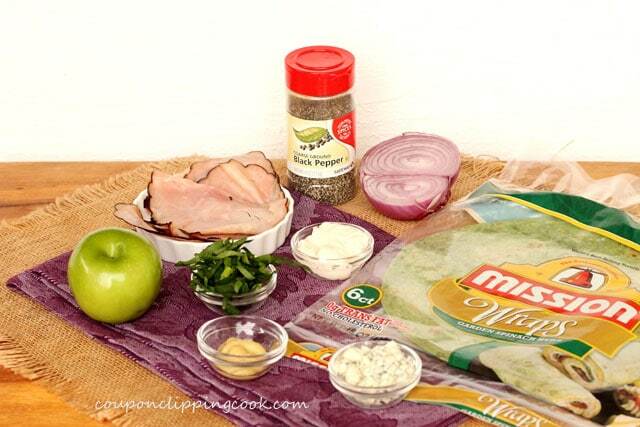 The ingredients in this wrap remind me of salads that have blue cheese in them with a sweet counterpart like apples. 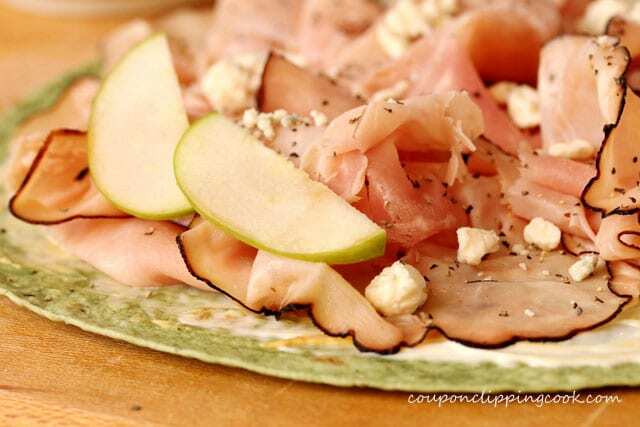 I like to load up on the apples in this wrap because the sweet or tart taste goes so well with the blue cheese and the ham. 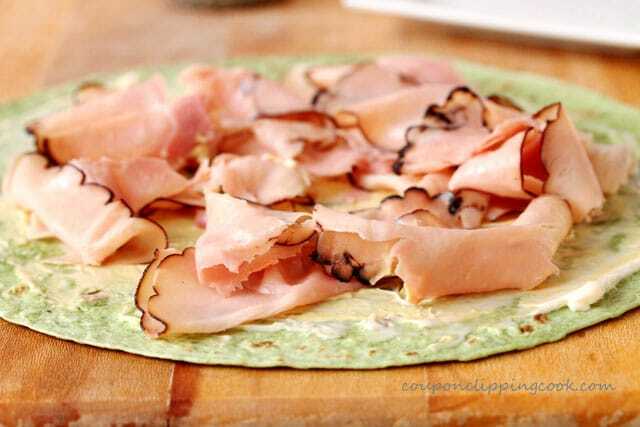 These wraps hold up nicely in the fridge too if made ahead of time. It’s something different to pack for lunch at work too. 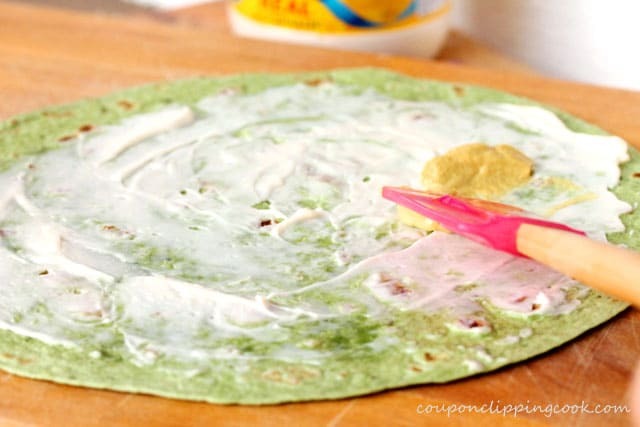 And a great color of green for a festive St. Patrick’s Day treat. 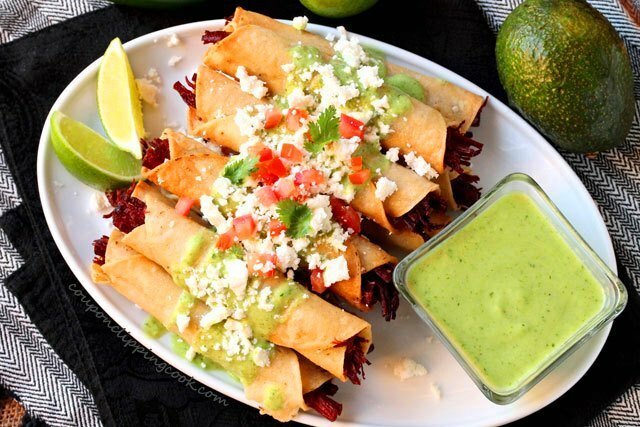 Here are more St. Patrick’s Day Recipes you may like “Coffee Cake with Baileys Irish Cream“, “Slow Cooker Guinness Corned Beef and Cabbage“, and “Apple and Mint Limeade Smoothie“. 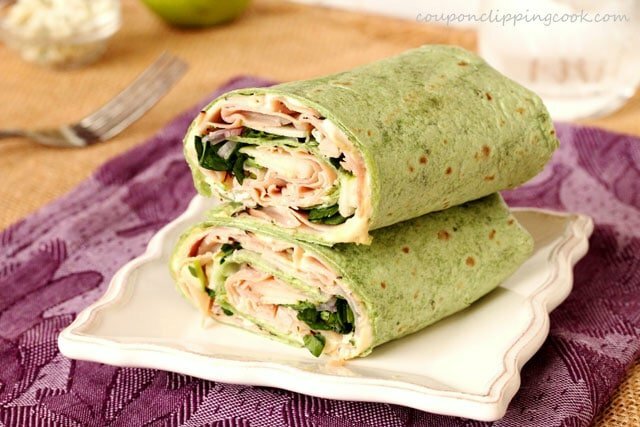 Any color or type of wrap or tortilla would work great for this sandwich so feel free to change up the wrap to your liking. 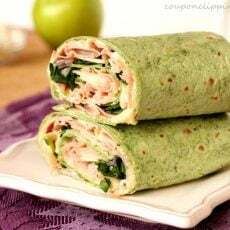 Here’s a wrap made in a whole wheat tortilla which looks and tastes wonderful “Turkey Cranberry and Cream Cheese Pecan Wrap“. 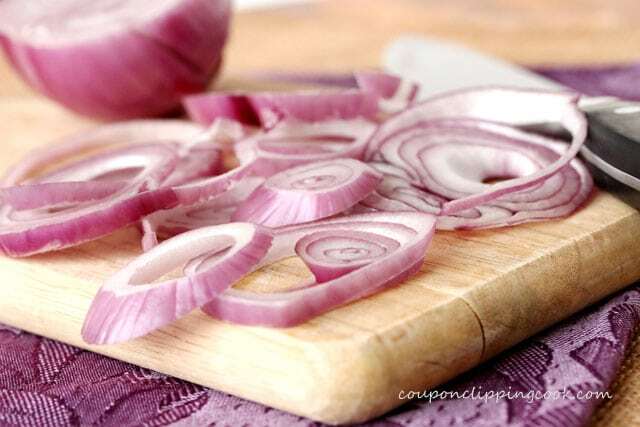 Thinly slice the red onion and set aside. 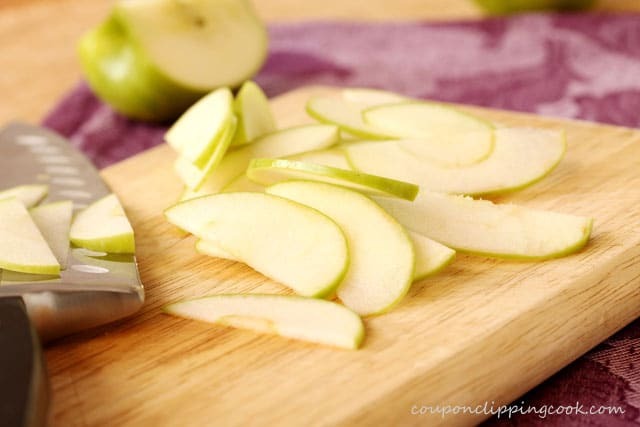 With the skin still on, cut the apple in half from the top to the bottom of the apple. Then cut each half into slices (around the core) that are about 1/4 of an inch thick. Set aside. 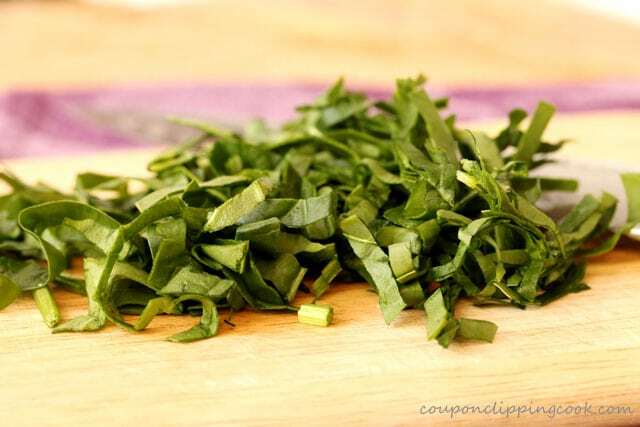 Cut the spinach into strips and set aside. Dijon mustard on the wrap. …kind of “fluffing” it up rather than laying it flat. 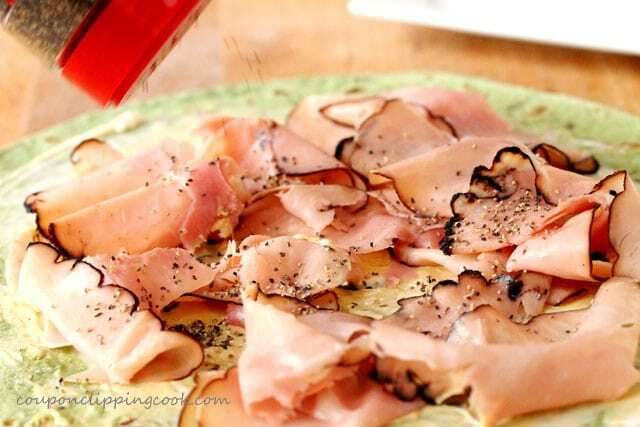 sprinkle coarse pepper on top of the ham. 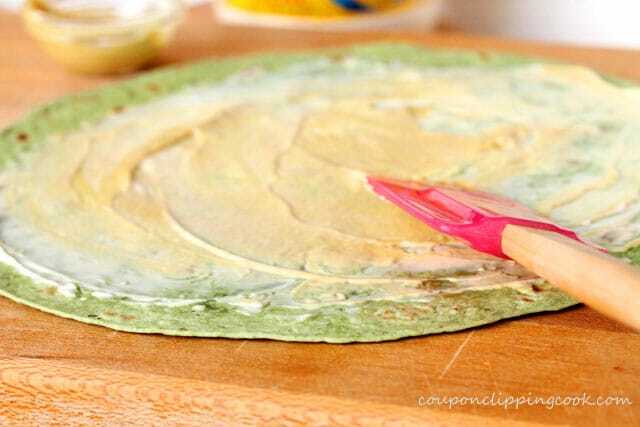 Gently fold the right and left sides of the wrap inwards about 1-1/2 inches on each side. 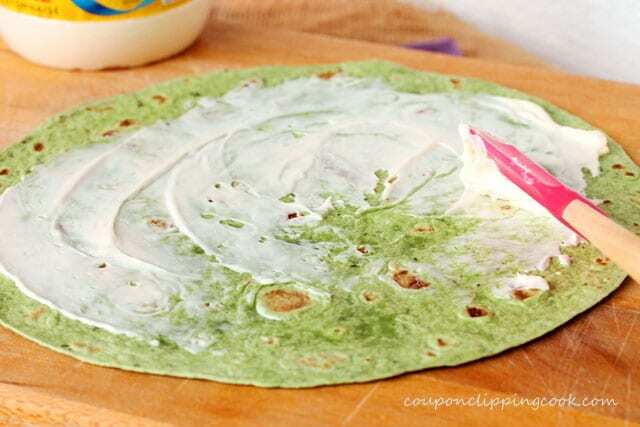 Then roll the wrap starting with the end closest to you towards the other end like you would a burrito. Cut in half on a diagonal. 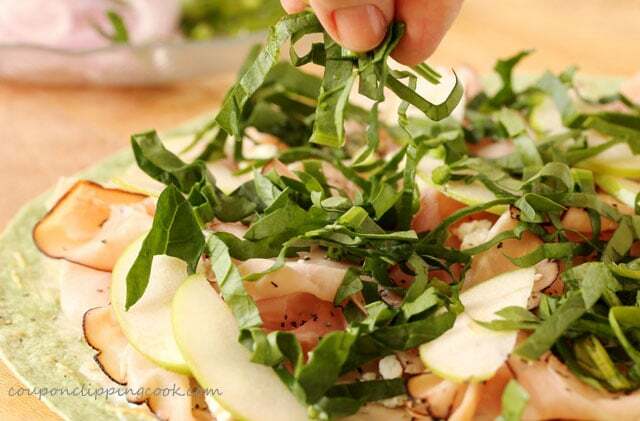 Serve with soup, salad or by its very own self and…enjoy. For the Apple - With the skin still on, cut the apple in half from the top to the bottom of the apple. Then cut each half into slices (around the core) that are about ¼ of an inch thick. Set aside. 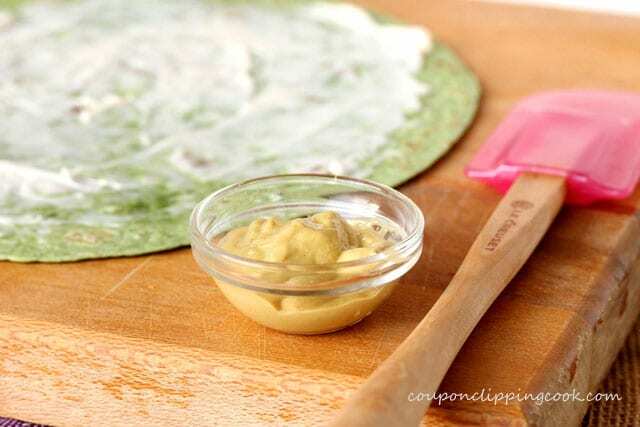 For the Wrap - Lay the wrap on a large cutting board or plate and spread the mayonnaise and mustard on the wrap. 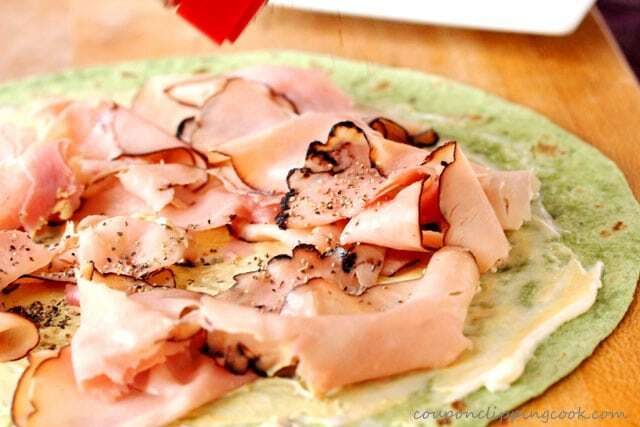 Add the ham, kind of “fluffing” it up rather than laying it flat. 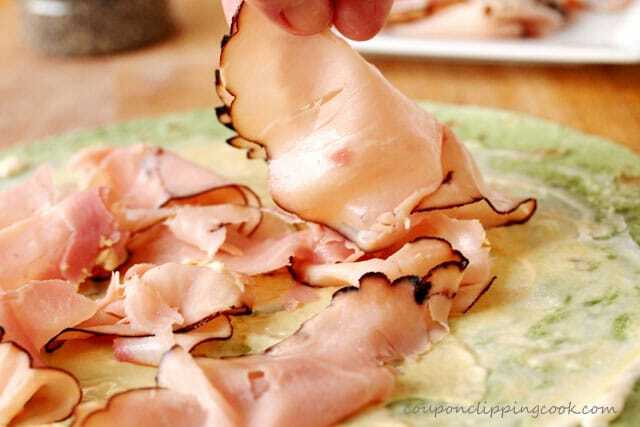 Sprinkle pepper on top of the ham. 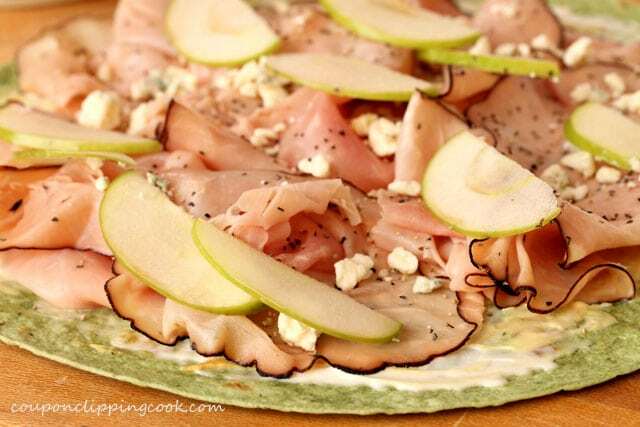 Top the ham with a layer of apple slices, crumbled blue cheese, spinach and onions. 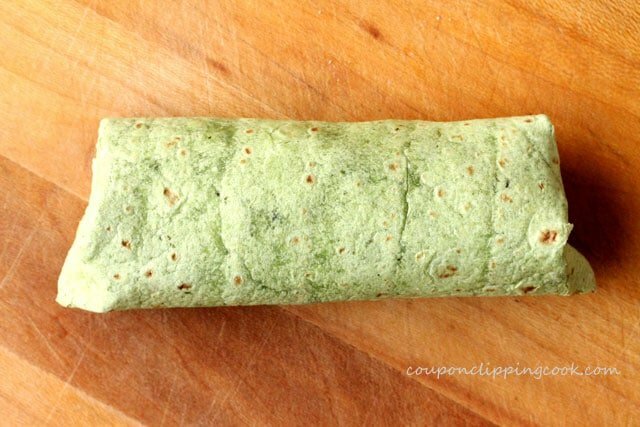 Roll the wrap starting with the end closest to you towards the other end like you would a burrito. Cut in half on a diagonal. Serve alone or with soup or salad. Hi Felicia, thank you so much for stopping by.